It is great…I like the mobile friendly option. Current email newsletter are a tad too expensive for small startups like ours, hopefully this will de-rail the competition and disrupt. Small startups usually have to do tedious hack to come up with their own internal solutions and considering email is like the standard for communication it really ought not to be that complicated. This looks very nice. Please include me. I think this being a great, easy-to-use alternative to e.g. MailChimp. Wow this is amazing. We are a start up and can’t afford an email based newsletter. Come from Australia things are even more expensive and difficult for startups. We’ve been using Pommo for several years but it’s development stopped and there is no API support or statistics. Mailchimp is little bit expensive for our purpose. MailerLite looks great – lower prices, API and nice stats. I like the nice clean interface! Simple and utilitarian which is just perfect. This is a great looking service. Wow, that looks great! Will like to try it out for my upcoming blog and book related websites. Nice service, can’t wait fort it! Would love to have MailerLite–sounds great! Awesome, would love to win this. A chimp is gonna be furious. The templates are looking good! I recommend to my clients for about a year and they are all happy, great product! Very nice offer, count me in. Will be great for startup. Greeting from Lithuania. Thumbs up! It’s very user friendly… Count me in! Dang it double posted. I’m that guy. oh cool, would be great to win one. Where is “want” button ? Would love to get my hands on this. Well…”hands” via use through my computer. Great stuff. Would love a license! Looks like a great service that just works. I like the video and how all the reporting is done. Would it kill though to put some background music in the background in the video and demo with an account that is not so obviously a dev one? Good job though, would use it if I won. My agency has been looking around for a solid and reliable service, like such, for an upcoming project – I think I’ve just found what Im looking for! Looks interesting. My agency has been looking for something that is improved over Mailchimp…this could be one of the ones we choose. 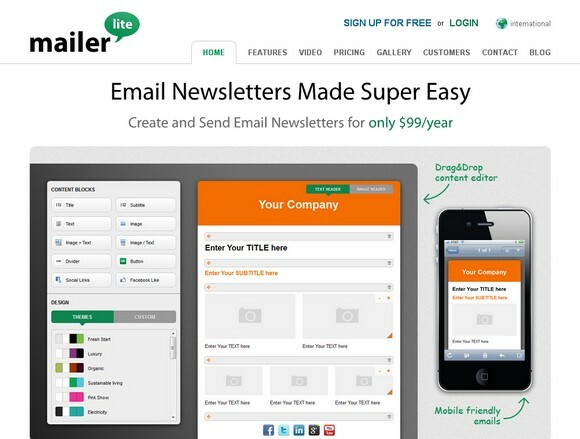 First time when hear about mailerlite, and from i see is good service for who want a profesional newsletter. Stylish and simple… a little bit like me. I like. Looks great. Setting up test account. Interesting new KISS player! sweet! Sounds awesome. This would be a great ‘next step’ for us. Ive also spread the word via Twitter ( https://twitter.com/toasterdroid/status/221140378596806656 ). We are currently looking for a mailing list solution. This would be perfect for us. Really nifty! Like it so far! Errr… Is that Comic Sans I see there? Never would I buy (or even use) a product that uses such an awful font! would love this or my new site! MailerLite looks terrific – perfect for my needs. And I agree about most newsletter programs being expensive. Count me in for the draw! Love it for not having fancy features! simplicity rules! Is it going to be my lucky day? Looks like I’m late at the party. But here I am to win this service badly as I m facing problem with SendMail service. Would put this to great use with my new blog. Need! Yup! Surely love to win this :) Thanks very much! Such account could come very handy for some client projects. Sounds like a great tool to use. I whant to use this tool forever!!! Noriu noriu noriu noriu noriu noriu noriu! Hi I ‘d like to get account. I need this for my brand new company! Looks like a great simple EMS. I’d love to win this. I would use this mailing list to notify people when inter-dimensional portals open up – ones that allow for accelerated spiritual evolution. Let’s see if I’ll be one of the 3 lucky readers. Would love to win if possible, would be a fantastic thing to promote some of my clients with! tum-dee-dum… Oh, a giveway! Should I enter?… Ok, seems cool enough. Wow, nice giveaway this is! I’ve been looking for a simple Mailchimp alternative for my clients and this looks perfect! Great contest! for the giveaway! Thanks to MailerLite for the giveaway! Love it! Way to go Mailerlite! Is there finally a good reason to not use mailchimp?!! I would love to be biased. sound great love it the news of free account.